I will be speaking “Cross-platform Continuous Integration and Continuous Deployment Workflows” at “Enterprise Conference 2015 for Modernizing Application and Optimizing IT Operations”. Team Foundation Server 2015 brings a major overhaul to the Team Foundation Server build system that not only addresses numerous points of customer feedback – like a web UI, change auditing, better agent pool management, and high availability but also unlocks whole new worlds by creating a dramatically simpler extensibility model, providing tasks for building almost anything you want – Java, Android, IOS, Node.js and more, and a cross platform agent that enables you to build on any platform you choose. In this session, you will see an end-to-end demonstrations of these capabilities within Team Foundation Server 2015. I will be speaking “Cross-platform continuous integration and continuous deployment workflows” at “DevCom Penang”. Many thanks to the event organizer for inviting me as a speaker at the event. 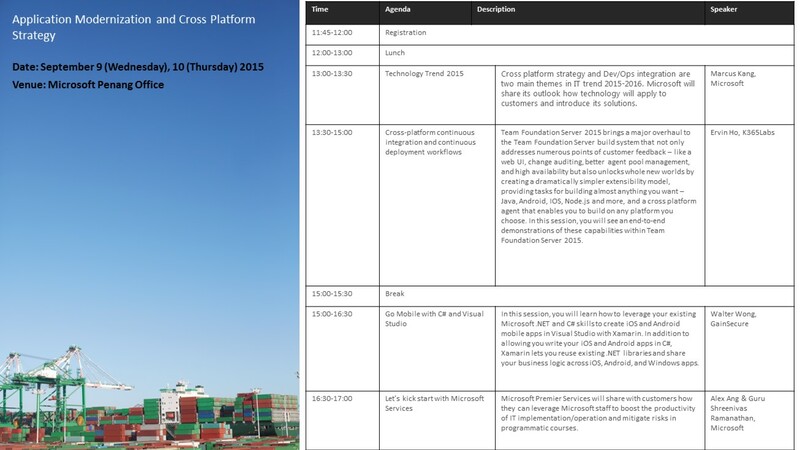 The event will be held at Microsoft Penang Office on September 9, 2015 and September 10, 2015.